I have a fondness for quilting. My own experiments in crazy-quilting and then sashiko quilting had me going blind doing fancy-stitching with wild and crazy colors and patterns as well as tactile combinations of bumps and lumps that were a heck of a lot of fun for me and for the heart-friends to whom I gifted these bits of silliness. That may be why this YouTube video, “Constellation Quilt,” (published in 2013 by Public Record) showing work by designer Emily Fischer and her design studio Haptic Lab caught my eye. The idea, expressed in the video, of wrapping yourself up in stars and time caught at the strings of my imagination. Then I saw another YouTube video, “Flying Martha Ornithopter.” This one was published in 2017 by Made Me Look. It, too, was about an object designed by Emily Fischer and Haptic Lab. Like Fischer, I understand that kites, winged things and even flapping flags can help us humans explore the movements and flow of the invisible forces of wind. 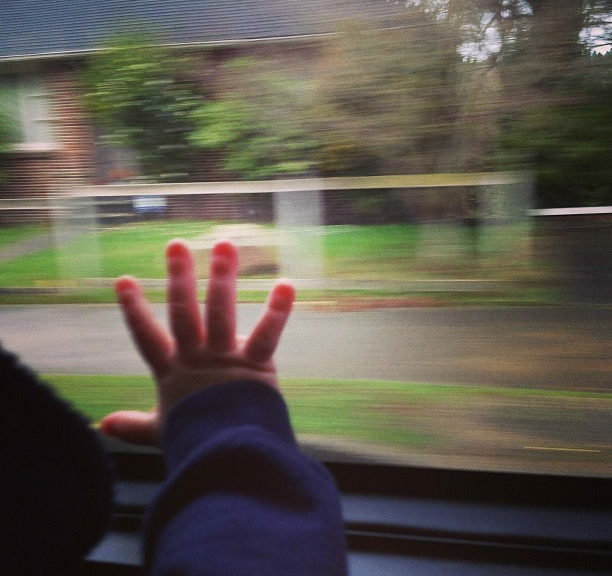 They can help us tap into the tactile joys of flight. It seems to me that I have found another person for whom tactile and sensory design – how a thing feels in your hand and on your skin – is as important as what the thing looks like. Even more importantly (for me anyway), here is a person for whom objects are repositories for the stories we tell ourselves about our lives. Among the objects Haptic Lab produces are extraordinarily detailed street maps that they call SoftMaps that can be customized and personalized for individual customers to show where their stories have taken place. It seems to me that designers like that are a rarity. Emily Fischer grew up in rural Wisconsin where she learned how to make such things as quilts and kites as a youngster. Even as an architect-wannabe, her crafty beginnings continued to find expression. As an undergraduate student at Taubman College of Architecture and Urban Planning at the University of Michigan in 2002, one of her projects was her first quilted map that she designed as a way-finding tool for the visually impaired. The inspiration for the project was her mother Peggy who had begun to lose her eyesight through complications from glaucoma. For these quilts, Emily combined her skill with computer-aided design and manufacture (CAD/CAM) rapid prototyping tools, and open-source mapping software as well as her grounding in the old-school, painstaking craft traditions of quilting and needlework with her explorations of haptics (the way humans perceive objects and sensations through touch). For years, she continued to make these quilts as side-projects while pursuing her career as an architect in New York City. In 2009, during the extreme depths of the recession, Fischer was laid off from her job at a commercial architectural firm. One of the first things she did was build a simple website with images of her experimental personal work that included objects exploring her interests in cartography and early flight. Fischer operates her accidental company, Haptics Lab, out of a Brooklyn studio with a small, close-knit team. The company is grounded in values that emphasize fair trade and sustainability. It is an extraordinarily useful compendium of advice from one who has gone down the road a ways on a path that she says makes her happy. This YouTube “How the Founder of Haptic Lab Uses Design to Drive Positive Change” was created by Skiftx contents studio in 2017. Do I go straight ahead? That keeps on trundling along. They stretch on to infinity, you know. And “back” just means more same-old. Along that road are intimidating. They jump up and down, even. Loss and devastation, they declaim. Aw, the heck with it, babe! What a fascinating post about EMILY FISCHER and the way in which she works. She is a great example of how one can create a successful and ethical business, and I enjoyed the video. I enjoyed your poem too. Do you know if her products are available in the UK, and if so, where? Chrissie, thanks for your visit and for sharing your thoughts. I am sure that Haptics Lab sells products online internationally. You may want to contact them for more information. Working by touch is a good way of really connect with what your doing and is a great outlook on life. Emily Fischer shows how you Can get extra expression in your work. 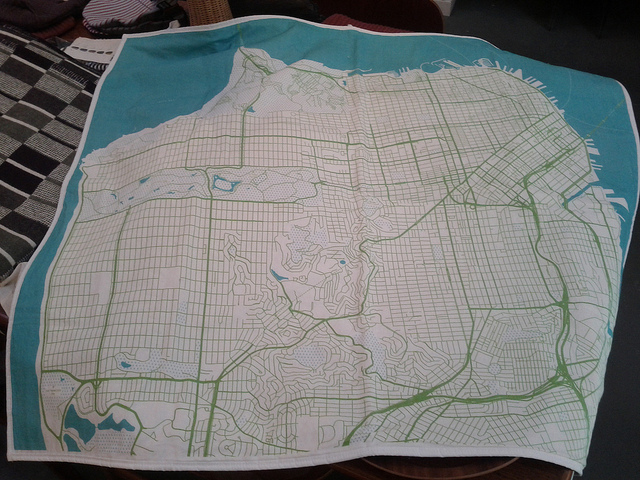 The San Francisco quilted map is amazing ! The attention to detail must have taken a very long time to complete and I can really appreciate the talent and effort gone into it. Darren, thanks for your visit and for sharing your thoughts. I do appreciate it. 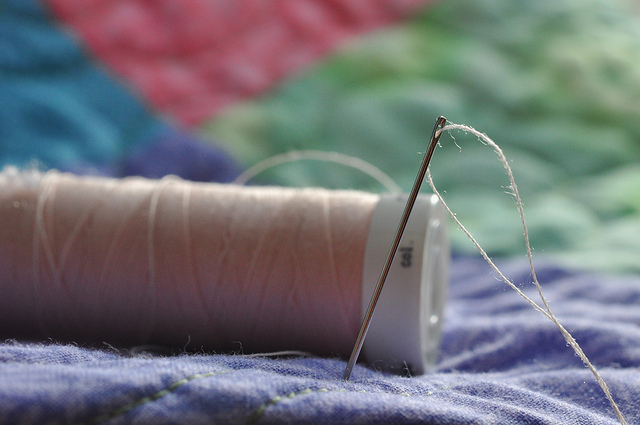 That is a very inspiring and motivating story about quilting. It interests me how people deal with hard obstacles and overcome them. At the beginning it seems impossible but over time it can be done and managed. Could you tell me more about ‘sashiko quilting’? My grandmother did some quilting as far as I remember in my childhood years. I was always watching her how she works. On the 4th grade when I was 10-11 years old I also tried some quilting at school. At the beginning it looked hard but after a few lessons it became clear. I was surprised at what I can do and how fast I learned new things. Now it is long gone but it is always nice to remember good memories. Thanks for an inspiring article and motivating story. Tomas, thanks for the visit and for sharing your story about your grandma. Sashiko is a form of Japanese straight-line quilting that is used to sew together many layers of material to make a stronger fabric. I used it for adding levels of stuff between the top and bottom layers of a piece so that I could get a topo-map feel to them. It was so fun! Glad you liked the post. Please do come again…. Emily Fischer is a beautiful inspiration for women everywhere. Through tough times she was able to use her lovely quilts as a means of making a difference in her life and basically starting over when she lost her job. I could feel the magic too as I watched the videos. I like how Emily uses the philosophy of design to make changes in her own life. Thank you sharing this wonderful information. By the way, I loved the poem. Mary Anne, thanks for your visit and for sharing your thoughts. I do appreciate it.